This is such an easy way to create even intricate shapes, and it may even encourage fussy kids to eat up. If you’ve ever tried to spoon out pancake batter to create fun shapes or numbers, you’ll probably have found it very difficult to get the batter to go where you want it to! You can use a piping bag instead, but it’s a messy and time-consuming way to get the perfect pancake shapes. Here’s an unbelievably easy hack to get perfect pancake shapes every time, and all you need is a clean ketchup or mayonnaise squeezy plastic bottle and your favorite pancake batter. This is such an easy way to create even intricate shapes, and it may even encourage fussy kids to eat up. Mix up your batter as usual, and then spoon or pour carefully into your clean squeezy bottle. Heat up your griddle or pan, and lightly grease it with a spray of cooking oil. Take your squeezy bottle and squirt out the pancake batter onto your hot griddle into the shape you want. 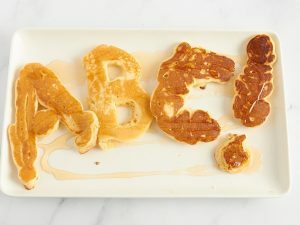 When the bubbles start forming on the surface of the pancake shapes, carefully flip them over. You may need to use two spatulas to flip the shapes without breaking them, depending on how big they are. Once the shapes are cooked to your liking, serve up and drizzle with syrup or a topping of your choice.